Please review the CryoFX System Operation Instructions below for a safe and smooth operation for your CO2 System. 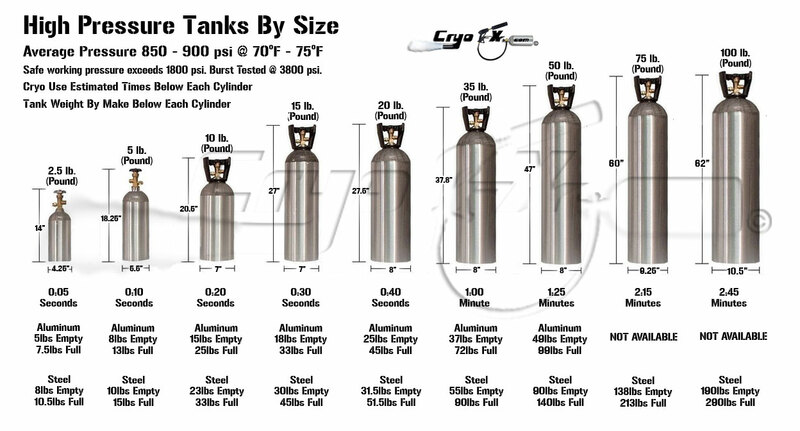 For approximate usage times, tank size options, and measurements, please click on the image to the left. 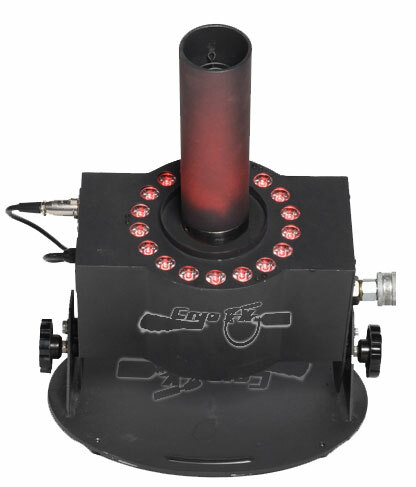 Setup Instructions: PRODUCT DESCRIPTION: CryoFX Cryo Gun CO2 Smoke Special Effects Cannon, one of CryoFX best sellers, is the perfect addition to any DJ system or mobile production. Have complete flexibility and maneuverability with CryoFX Cryo Gun. Utilizing no electricity and weighing only 6 pounds (3Kg), this Cryo Gun is extremely lightweight and has the ability to be used almost anywhere. Add a new element and a huge surprise to any show. Incorporating easy connections and including 25 feet (7.62 meters) of hose, along with a step by step pictorial user manual, you will be ready to use this Cryo Gun in minutes, pending you already have CO2. Measuring only 20 inches (50.8cm) by 9 inches (22.86cm), CryoFX Cryo Gun is small in size which makes it easy to carry. CryoFX Cryo Gun has the capability to spray CO2 clouds 20-30 feet (7-10 meters) or more. 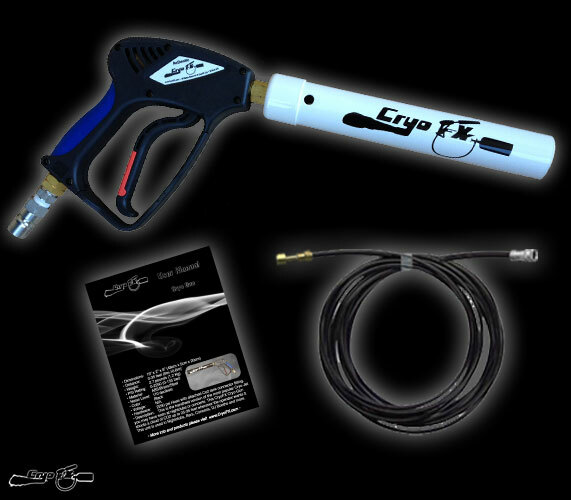 With options available such as; custom nozzle colors, custom hose lengths, custom nozzle lengths and nozzle widths, and much more, that unique touch for your Cryo Gun is just fingertips away. Simply call or email us for your custom order! Comes with limited lifetime manufacture warranty! 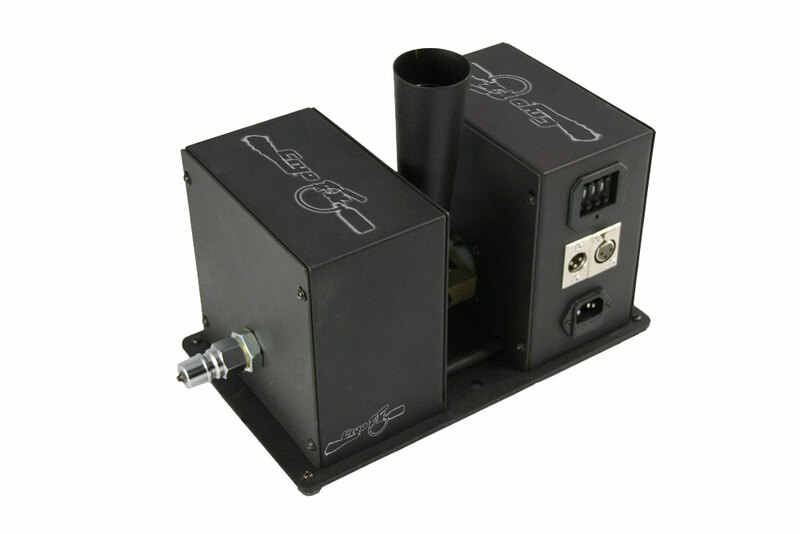 Setup Instructions: PRODUCT DESCRIPTION: Two-Piece Plug and play handheld CO2 Cannon, with hose and fitting ready to use in minutes, simply connect to a CO2 tank! This package comes with the following: • CO2 Cannon with attached quick disconnect fitting • 5 Foot long high pressure CO2 Cryo hose with attached quick disconnect fitting (longer lengths available upon request) • Brass fitting (to connect hose to CO2 Tank) (Tank NOT included) • Manual, Safety Guidelines, and FAQ (Frequently Asked Questions) • 12 MONTH WARRANTY AGAINST OPERATIONAL/MECHANICAL DEFECTS • Timely Customer Service via phone, text, and email. 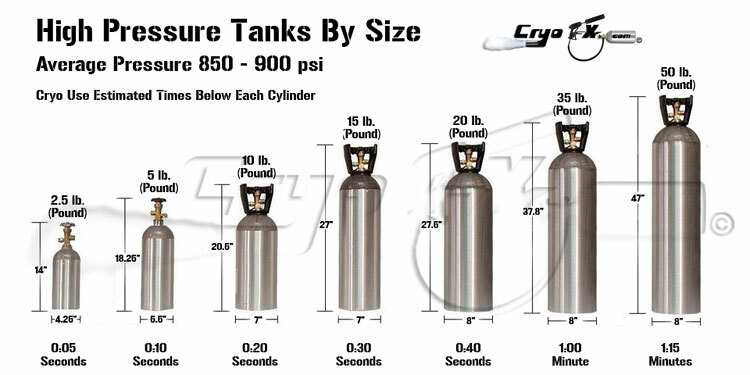 NOTE: The CO2 Tank and CO2 are NOT included in this auction. You WILL need to purchase these separately for any CO2 gun to work. The hose and CO2 Cannon listed here have quick disconnect fittings already installed so you can easily disconnect the hose from the CO2 Cannon when not in use. 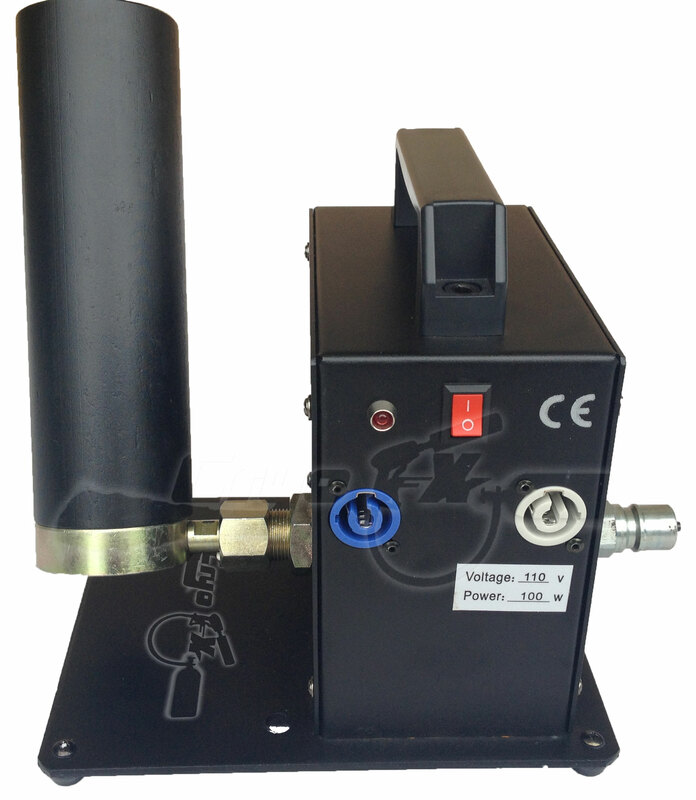 NO electricity is required for this package, simply connect the hose to the CO2 Cannon, and the other end of the hose to your CO2 tank and your ready to go IN MINUTES! This CO2 Cannon shoots a 25'-30' foot long stream which is about 4.5' wide! These CO2 Cannons are used in stage productions, nightclubs, bars, live performances, concerts, haunted houses, special events and much more. They are similar to a fog machine but do not linger like fog, do not leave a residue or weird smell, or set off fire alarms. The CO2 dissipates within seconds after coming out of the cannon so the cloud vanishes seconds after the user stops spraying. Setup Instructions: PRODUCT DESCRIPTION: Two-Piece Plug and play handheld CO2 Bazooka, with hose and fitting ready to use in minutes, simply connect to a CO2 tank! This package comes with the following: • CO2 Bazooka with attached quick disconnect fitting • 5 Foot long high pressure CO2 Cryo hose with attached quick disconnect fitting (longer lengths available upon request) • Brass fitting (to connect hose to CO2 Tank) (Tank NOT included) • Manual, Safety Guidelines, and FAQ (Frequently Asked Questions) • 12 MONTH WARRANTY AGAINST OPERATIONAL/MECHANICAL DEFECTS • Timely Customer Service via phone, text, and email. NOTE: The CO2 Tank and CO2 are NOT included in this auction. You WILL need to purchase these separately for any CO2 gun to work. The hose and CO2 Bazooka listed here have quick disconnect fittings already installed so you can easily disconnect the hose from the CO2 Bazooka when not in use. NO electricity is required for this package, simply connect the hose to the CO2 Bazooka, and the other end of the hose to your CO2 tank and your ready to go IN MINUTES! This CO2 Bazooka shoots a 25'-30' foot long stream which is about 4.5' wide! These CO2 Cannons are used in stage productions, nightclubs, bars, live performances, concerts, haunted houses, special events and much more. They are similar to a fog machine but do not linger like fog, do not leave a residue or weird smell, or set off fire alarms. The CO2 dissipates within seconds after coming out of the Bazooka so the cloud vanishes seconds after the user stops spraying. Setup Instructions: PRODUCT DESCRIPTION: CryoFX Cryo Gun CO2 Jet Cannon, one of CryoFX best sellers, is the perfect addition to any DJ system or mobile production. Have complete flexibility and maneuverability with CryoFX Cryo Gun. 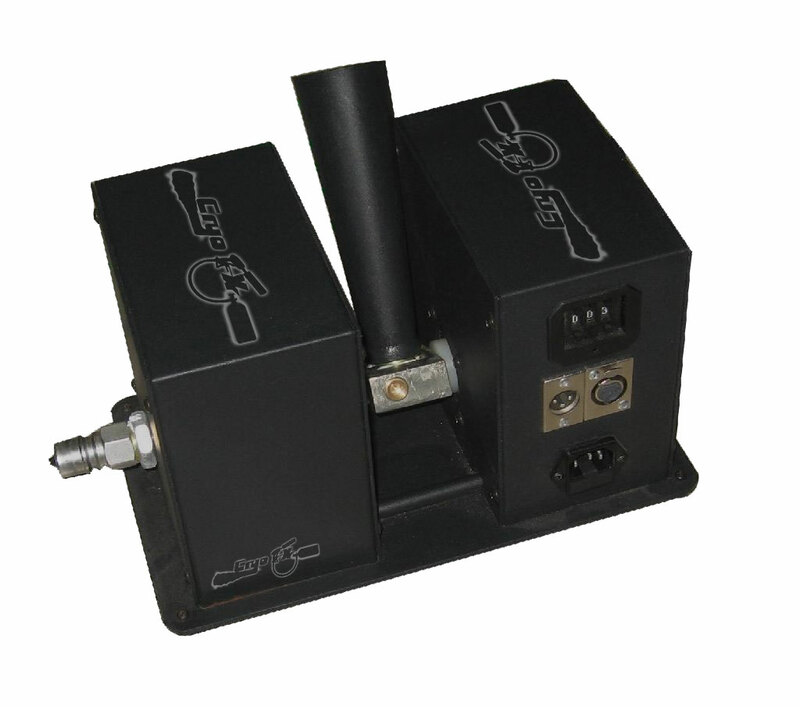 Utilizing no electricity and weighing only 4 pounds (1.8Kg), this Cryo Gun is extremely lightweight and has the ability to be used almost anywhere. Add a new element and a huge surprise to any show. 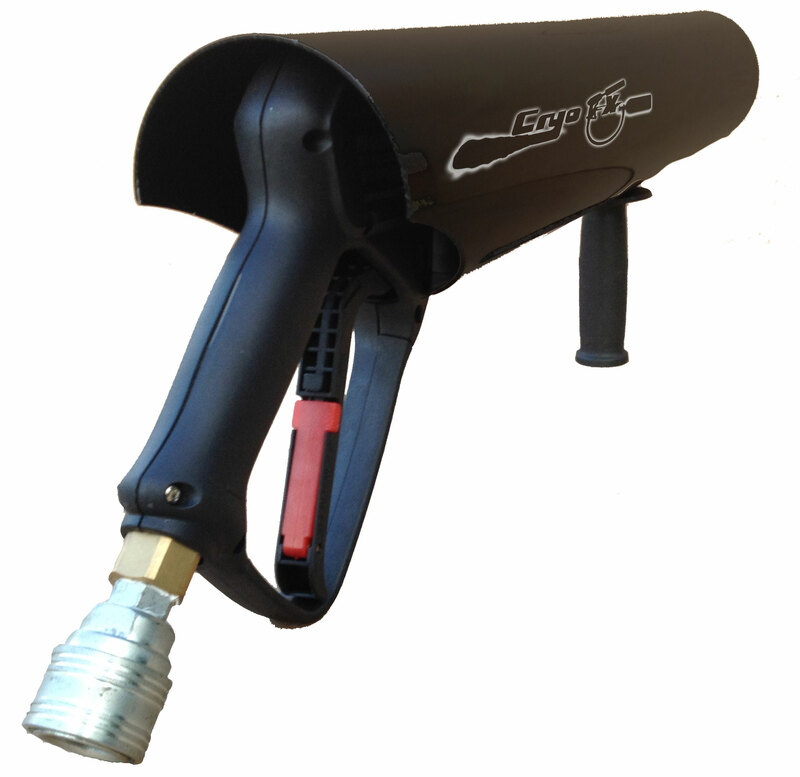 Incorporating easy connections and including 25 feet (7.62 meters) of hose, along with a step by step pictorial user manual, you will be ready to use this Cryo Gun in minutes, pending you already have CO2. Measuring only 20 inches (50.8cm) by 9 inches (22.86cm), CryoFX Cryo Gun is small in size which makes it easy to carry. CryoFX Cryo Gun has the capability to spray CO2 clouds 20-30 feet (7-10 meters) or more. With options available such as; custom nozzle colors, custom hose lengths, custom nozzle lengths and nozzle widths, and much more, that unique touch for your Cryo Gun is just fingertips away. Simply call or email us for your custom order! Comes with limited lifetime manufacture warranty! Setup Instructions: PRODUCT DESCRIPTION: CryoFX CO2 Jet DMX 512 is the ultimate must have when considering a DMX style CO2 Jet. Taking a standard Co2 Jet and adding DMX capabilities with the option to assign any one of 512 DMX channels, this Co2 Jet is most widely used where DMX channel assignment is of importance. Constructed of a thick metal casing, the Co2 Jet DMX 512 will last through rugged conditions such as tours, mobile applications, and similar. CryoFX CO2 Jet DMX 512 has the capability to be linked to other units via DMX for simultaneous control of multiple jets. It also offers the option to link to other units via power speakon in/out connectors for use of one plug for multiple units (Co2 Jet comes stock with power plug connected to one speakon connector. Additional speakon connector is included in package for users option to daisy chain units.) The nozzle may be adjusted to release CO2 clouds at an angle if so desired by adjusting a fitting at the base of the nozzle. This Cryo Jet comes in 110vAC and 220vAC with ability to be installed on truss or used on floor. Built to withstand rugged conditions, the CO2 Jet DMX 512 reaches heights of 24-34 feet (8-10 meters) and weighs only 18 Lbs (8.1Kg). With easy to follow instructions, included manual and 15 feet (5 meters) of hose, and quick setup time, you will be ready to use this CO2 Jet in minutes, pending you already have CO2. Compatible with both high and low pressure systems. 1 year manufacture warranty. CO2 is not included. Setup Instructions: PRODUCT DESCRIPTION: CryoFX CO2 Jet DMX 512 Switchable, one of CryoFX best sellers, remains industry standard when referring to CO2 Jets. Its simple design and ease of use allows for both DMX and Standard Power switch on/off capabilities. While in DMX mode, can be controlled by a DMX 512 controller utilizing 1 channel of DMX for on/off control. While in "Standard" mode, this cryo jet can be controlled by any on/off switch to the power supply feeding power to the unit. (Example: power strip on/off button being used to turn the cryo jet on/off when jet is plugged into the power strip and is in Standard mode). CryoFX CO2 Jet DMX Switchable is lightweight and has the capabilities to be linked to other units for simultaneous control of multiple jets. The nozzle may be adjusted to release CO2 clouds at an angle if so desired. This Cryo Jet comes in 110vAC and 220vAC with ability to be installed on truss or used on floor. Built to withstand rugged conditions, the CO2 DMX Switchable Jet reaches heights of 24-34 feet (8-10 meters) and weighs only 14.4 Lbs (6.5Kg). With easy assembly, included manual and 15 feet (5 meters) of hose, and quick setup time, you will be ready to use this CO2 Jet in minutes, pending you already have CO2. Compatible with both high and low pressure systems. 1 year manufacture warranty. CO2 is not included. Setup Instructions: PRODUCT DESCRIPTION: CryoFX CO2 LED Jet is guaranteed to "brighten" up any event. Incorporating 18 individual 3-in-1 LED lights around the base of the nozzle, this DMX controlled CO2 Jet can light up CO2 clouds almost any color, to include; Red, Green, Blue, Yellow, Purple, Cyan, Orange, and White! Instantly light up your clouds of CO2 with vibrant colors to create effects imitating that of 'Fire' (orange or red light) or 'Clouds' (blue or purple light) or simply match the color scheme of your event or venue. CryoFX CO2 LED Jet is designed to have a high light and CO2 output while maintaining low noise output. Controlled by a standard DMX 512 controller, this LED Cryo Jet uses only 2 channels of DMX; 1 channel for on/off of CO2 and 1 channel for on/off/color of lights. Reaching a height of 24-34 feet (8-10 meters) and only weighing 30.9 Lbs (14Kg), CryoFX CO2 LED Jet will give you amazing effects while remaining easy to move. This LED Jet is linkable to other units through XLR DMX Connectors and can be mounted on a truss or used as stand alone on the floor, with about a 120 degree angle adjustment capability. It may be used with high or low pressure CO2 Systems and is available in both 110vAC and 220vAC. LED CO2 Jet also comes with 1 year manufacture warranty from date of purchase. Package comes complete with user manual and 15 feet (5 meters) of hose so you are ready to use in minutes. CO2 is not included. Setup Instructions: PRODUCT DESCRIPTION: CryoFX CO2 LED Jet Switchable is not only guaranteed to "brighten" up any event but also offer the option of different pre-selected modes or full DMX control via individual DMX channels. Incorporating 18 individual 3-in-1 LED lights around the base of the nozzle, this DMX controlled CO2 Jet can light up CO2 clouds almost any color, to include; Red, Green, Blue, Yellow, Purple, Cyan, Orange, and White! Instantly light up your clouds of CO2 with vibrant colors to create effects imitating that of 'Fire' (orange or red light) or 'Clouds' (blue or purple light) or simply match the color scheme of your event or venue. CryoFX CO2 LED Jet Switchable is designed to have a high light and CO2 output while maintaining low noise output. With the ability to run pre-programmed patterns or take full control of colors, sound activation, strobe, and fades, and more via individual dmx channels, the possibilities are almost endless! Controlled by a standard DMX 512 controller, this LED Cryo Jet uses only 7 channels of DMX; 1 channel for on/off of CO2, 1 channel for on/off/dimming of lights, 1 channel for each of the base colors (red, green, blue), 1 channel for strobe/speed function, and 1 channel for color mixing. Reaching a height of 24-34 feet (8-10 meters) and only weighing 18 Lbs (8.16Kg), CryoFX CO2 LED Jet Switchable will give you awesome colors and effects while remaining easy to move. 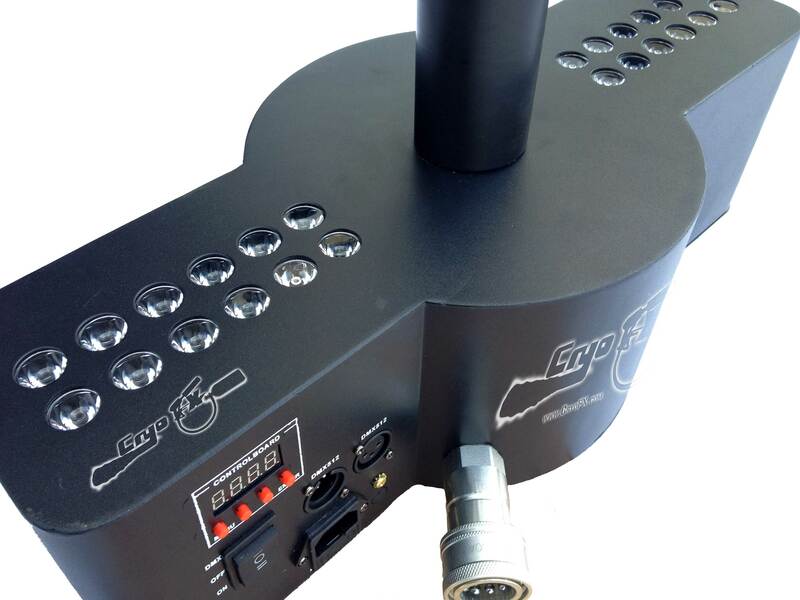 This LED Jet is linkable to other units through XLR DMX Connectors and can be mounted on a truss or used as stand alone on the floor, with about a 120 degree angle adjustment capability. It may be used with high or low pressure CO2 Systems and is available in both 110vAC and 220vAC. LED CO2 Jet Switchable also comes with 1 year manufacture warranty from date of purchase. Package comes complete with user manual and 15 feet (5 meters) of hose so you are ready to use in minutes. CO2 is not included. Setup Instructions: PRODUCT DESCRIPTION: CryoFX CO2 LED Jet Inline is the perfect fit for stage productions when a non-mounted cryo jet is needed to simply sit on the stage and point directly upward. With the same capabilities as the LED Jet Switchable, this LED Jet includes pre-selected modes and full DMX control via individual DMX channels. Offering the most LEDs of any CryoFX Co2 Jet, this unit houses 24 individual 3-in-1 LED lights, two rows of 6 on each side of the nozzle. This DMX controlled CO2 Jet can light up CO2 clouds almost any color, to include; Red, Green, Blue, Yellow, Purple, Cyan, Orange, and White! Instantly light up your clouds of CO2 with vibrant colors to create effects imitating that of 'Fire' (orange or red light) or 'Clouds' (blue or purple light) or simply match the color scheme of your event or venue. CryoFX CO2 LED Jet Inline is designed to have an extremely high light and CO2 output while maintaining low noise output. With the ability to run pre-programmed patterns or take full control of colors, sound activation, strobe, and fades, and more via individual dmx channels, the possibilities are almost endless! Controlled by a standard DMX 512 controller, this LED Cryo Jet uses only 7 channels of DMX; 1 channel for on/off of CO2, 1 channel for on/off/dimming of lights, 1 channel for each of the base colors (red, green, blue), 1 channel for strobe/speed function, and 1 channel for color mixing. Reaching a height of 25-35 feet (8-10 meters) and only weighing 13 Lbs (5.89Kg), CryoFX CO2 LED Jet Inline will give you awesome colors and effects while remaining easy to move across your stage. This LED Jet is linkable to other units through XLR DMX Connectors. It may be used with high or low pressure CO2 Systems and is available in both 110vAC and 220vAC. LED CO2 Jet Inline also comes with 1 year manufacture warranty from date of purchase. Package comes complete with user manual and 15 feet (5 meters) of hose so you are ready to use in minutes. CO2 is not included. 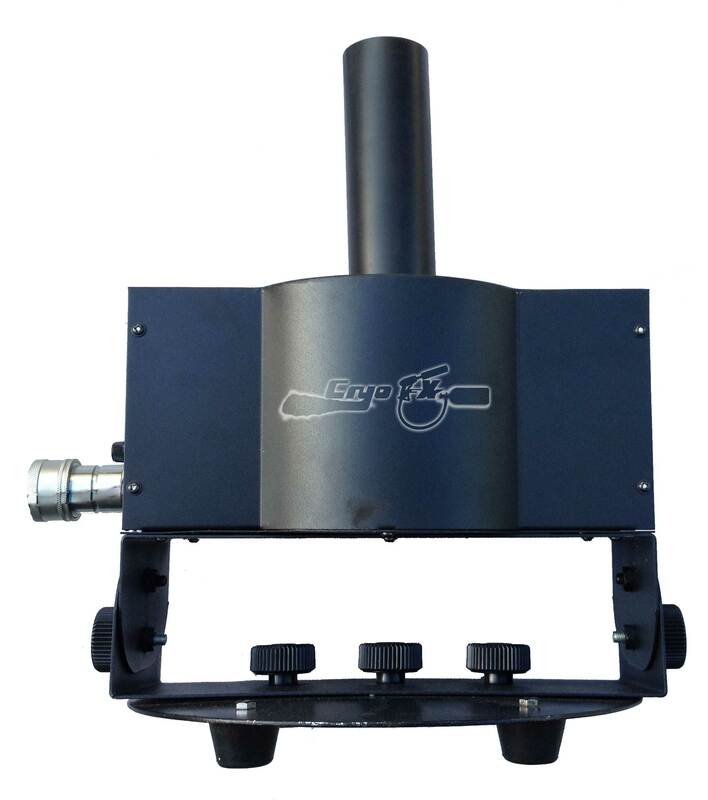 Dimensions: 11.81" x 7.09" x 9.06"
Setup Instructions: PRODUCT DESCRIPTION: CryoFX CO2 Swing Jet will put movement in any production with its 180 degree range of effect output. Using a standard DMX 512 controller, you can maneuver the nozzle back and forth up to 180 degrees while releasing CO2 Clouds creating as much as a "Half Circle" of CO2 and only utilizing 2 channels on the DMX controller (1 channel for on/off of CO2 and 1 channel for movement of "swinging" nozzle)! With the ability to control the movement of the nozzle and the CO2 on/off separately, you have the option to spray CO2 in any direction, side to side, you desire. Multiple units together can create "Arcs" or "Half Circles" of CO2 which will make any show stand out. CryoFX CO2 Swing Jet has the option of 110vAC or 220vAC with the ability to reach a height of 24-34 feet (8-10 meters). Weighing only 19.8 Lbs (9Kg) the Swing Jet can be placed on the floor, mounted on a truss, or suspended from the ceiling. 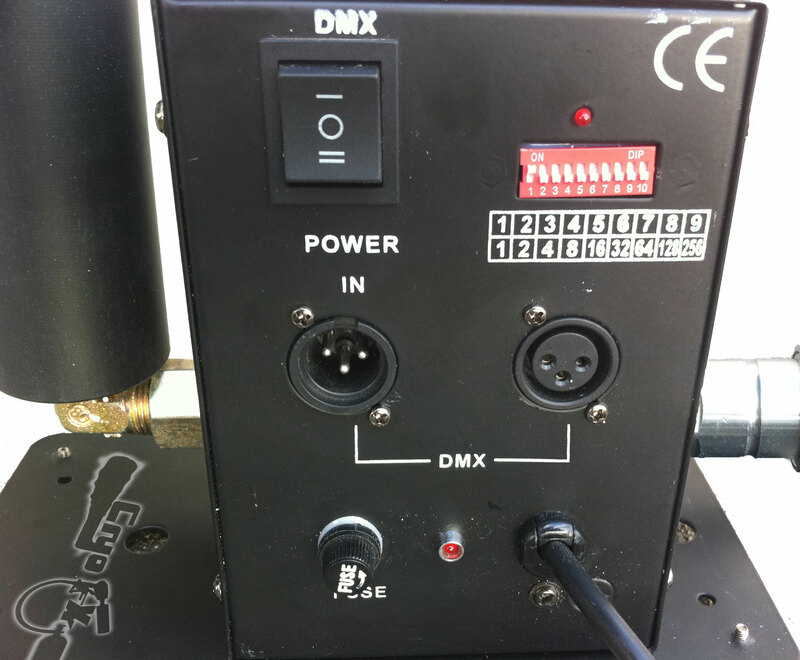 It is linkable to other units through DMX XLR Connectors and comes with a 15 foot (5 meter) hose and 1 year manufacture warranty. 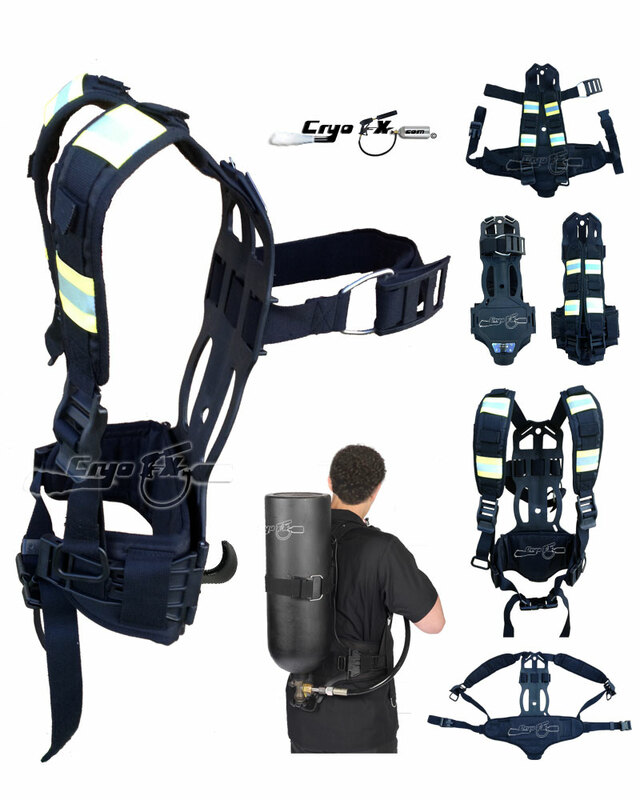 Package comes complete with user manual and 15 feet (5 meters) of hose so you are ready to use in minutes. Compatible with both high and low pressure systems. CO2 is not included. Setup Instructions: PRODUCT DESCRIPTION: CryoFX Cryo Gun CO2 Backpack, one of CryoFX best sellers, is the perfect addition to any DJ system or mobile production. Have complete flexibility and maneuverability with CryoFX Cryo Gun. Utilizing no electricity and weighing only 8 pounds (3.63Kg), this Cryo Gun is extremely lightweight and has the ability to be used almost anywhere.